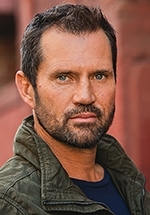 Langley Kirkwood is an English-born South African actor best known for his roles in the international television series Generation Kill, Black Sails and Banshee. Local television shows he has acted in include Backstage, Isidingo, Charlie Jade and the second season of Snitch. He has also made guest appearances in the ITV drama series Wild at Heart and the SABC3 drama Hard Copy. He played the role of Nolan Murray in the M-Net soccer drama series League of Glory, in 2010; and the guest starring role of Interpol agent Liam Hartley in the M-Net soapie The Wild, in 2012. Kirkwood's family relocated to South Africa when he was young and during his schooling he fell in love with the art of acting, which he studied at school and then at the prestigious University of the Witwatersrand. His breakthrough performance was as Billy the Kid in Shooting Billy the Kid at Johannesburg's Market Theatre, for which he won an FNB Vita Award. He was a member of The Mechanicals Theatre Company in Cape Town, and his stand-out role on Cape Town stages was that of Biff Loman opposite Bill Flynn In Arthur Miller's Death of a Salesman, which earned them both Fleur du Cap awards. Langley has appeared in the numerous made-for-TV movies, including Die Spesenritter, Der Kranichmann, Für immer verloren, Red Water, King Solomon's Mines, Dracula 3000, Atlantis: End of a World, Birth of a Legend, Die Jagd nach dem weißen Gold and The Challenger Disaster. He has also acted in the mini-series Natural Rhythm, The Triangle and The Bible. He played the role of Kruger in the 2006 direct-to-video release Mercenary For Justice and in 2008 he played the role of Sgt. Steven Lovell in the HBO Iraq war mini-series Generation Kill. In 2013/2014 he had a recurring role in the Starz adventure series Black Sails in which he played Captain Bryson. He also recurred as Jeep in the second season of the Starz fantasy series Dominion. In April 2014 he was signed to the third season of Banshee as Colonel Douglas Stowe, a former commando who runs an illegal business from Banshee's Camp Genoa. The season flighted on Cinemax in 2015. Kirkwood has an extensive theatre resume as well, which includes roles in the productions Shooting Billy the Kid at the Market Theatre (1996); Indiscretions at the Civic Theatre (1996); Mojo at the Market Theatre (1996); Southern Born for Artscape in 1999; Hello and Goodbye at the Baxter Theatre in Cape Town (2000); Birdy (2000) at the Civic Theatre in Johannesburg; Locked (2001) for Artscape; and Death of a Salesman at the Baxter and Market theatres in 2001. He was married to former Calvin Klein supermodel Josie Borain from 2002-2012 and the couple had two children together. He spends much of his free time trail running, cycling and competing in ultra-distance triathlons such as the Ironman.